A petite woman in her 50s, Barrett is a wealth of stories and experiences — just like the physical space of her store. Small with low-ceilings, Bookends & Beginnings winds around, opening up at its heart to a cozy drawing-room-like area with huge wooden tables and rocking chairs on warm carpets. Having graduated in the ’80s from Northwestern University’s Medill School of Journalism, Barrett flitted in and out of the books business until 2014, when she finally started the Bookends & Beginnings. She took over the space once occupied by Bookman’s Alley, another Evanston legend. 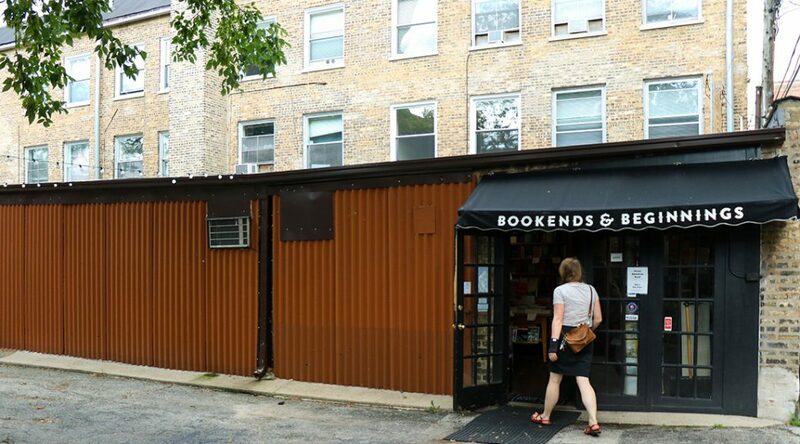 “In fact, one of the first things that I did as a Medill graduate student in my first quarter was come to Bookman’s Alley and write an article about Roger Carlson, who was the owner,” she says, recalling that she had known about this space going back to almost the first week that she was in Evanston. If that seems retrospectively serendipitous, then so will mostly everything she has done. As a new mother post-graduation, she worked part time at Women and Children First, a feminist bookstore in Chicago’s Andersonville neighborhood while doing book-writing projects on the side. At one point, she was even its manager. “I wasn’t intentionally trying to learn how to run an independent bookstore, but I learned a lot,” she says. Despite the hands-on experience, Barrett acknowledges that nothing had prepared her to start a book store from scratch. If true, in the four years since it has opened, Bookends & Beginnings has come a long way. At the store, Barrett crafts an experience that is uniquely personal. Her hand-written and signed review blurbs (“shelf-talkers,” in industry parlance), posted under favorite books, are a more personal take on the recommended bestseller shelves at chain bookstores. Adding to this is the amount of time and effort that goes into curating what sort of books find a home in the shelves at the store. Barrett makes Bookends & Beginnings a place for discoveries, making a trip to the bookstore a journey rather than a mere consumer experience. For instance, a whole shelf is dedicated to eclectic cookbooks from around the world. Barrett mentions one from Azerbaijan with a recipe for horse-hooves. At the table where we are sitting lays “Restoring the Minoans,” a book that puts to test theories about life in the Greek Bronze Age by famous British archeologist Sir Arthur Evans. Near where we are sitting, is her husband Jeff Garrett’s specially curated collection of children’s books. A product of his extensive travels, the collection has also benefitted from well-travelled and thoughtful customers from the community. There are titles from Spain to South Africa, and from Rwanda to China, Barrett says, adding how it is important for children to learn of how childhoods in different parts of the world can be so vastly different from their own. Just then, customers come by to browse this portion of the store. Their voices drop to a whisper, not wanting to disturb Barrett’s meeting, even as one or two of them acknowledge her with a slight nod in her direction. It is clear that Barrett’s relationship with Bookends & Beginnings and its customers is intrinsic to her contained personality. But she reminds me just then that there was a time when she’d quit the book business as a whole. This was around 2005, when e-books were on the rise and things got worse for bookstores. She’d dropped all ties with books and enrolled herself in the Cooking and Hospitality Institute of Chicago, and worked in various kitchens for a few years. In a few years, she’d circle back to her journalistic roots, combining her culinary training with it, to develop the James Beard Award winning “Fear of Frying” radio series for WBEZ. The influence of this experience is clearly visible even to this day, with the collection of cookbooks at the store. “It was fascinating to me what the differences are between having a voice in print, and having a voice with your voice,” Barrett says. It was only when the bookstore chain Borders had shut shop in 2011 and Barnes and Noble had started diverting its interest away from books that she started taking notice of the book-selling space again. Her beloved Bookman’s Alley and Women and Children First were also on the brink of closure, despite weathering the 2005 e-book storm. That’s when she decided to step in. That’s exactly what Bookends & Beginnings has grown into. A few days before the verdict on the Northlight high-rise was announced, an Evanston prep school had a grade 5 class trip to the store. They spent their time here learning through conversation and various books at the store about life in ancient Egypt, and how Cleopatra might’ve studied. There are also weekly events at the Bookends & Beginnings. In addition to readings with authors, multiple book clubs run in parallel. The Very Short Book Club for instance, is working towards exploring a title each month from the Oxford University Press’ Very Short Introduction series of books, while The Mortality Book Club reads and discusses oft-avoided topics that confront people at the end of their lives. Another popular series of events at the Bookends & Beginnings is Storytime!, aimed at children between ages 2-6 to come in and spend their evenings with real time storytelling. Barrett has ensured, through these beyond-commerce interactions, that the store and the community share a strong and continuous relationship. This came of use especially when the space was, for six months, simmering in the uncertainty of its existence. Barrett had mobilized the community to speak up about what the space meant to them. For five months, she continuously pushed citizen petitions to stop re-development of the block through the store’s newsletter. But on 31 January, the day that the issue came up for discussion with Evanston’s Economic Development Council, Barrett was sick with the flu and couldn’t attend the city council meeting. That didn’t stop more than 20 Evanstonians from speaking up for her store — for their store. “I see it as a sort of intercostal muscle in the city,” said Elena Gonzales, an Evanston resident of over 30 years and Bookends & Beginnings regular, at that meeting. “The businesses in and around the alley in particular are so special that novelists have written about them. I don’t know if anyone here has had the experience of having someone say ‘Oh you’re from Evanston? I’ve read the Time Traveler’s Wife! Is that bookstore real?’ Yes, it is real! We have it, let’s not ruin it,” she said to the aldermen, referring to the store’s importance and reference in pop culture. Barrett watched the proceedings through a livestream feed online. Weeks later, she’d attribute the success of the campaign to “people power”. “The book business doesn’t have that many rewards other than loving reading, loving being a reader, and sharing that with other people,” she says as her younger son George Garrett puts two Hershey’s kisses with the receipt, on top of a book that one of the last customers of the day has purchased. It’s almost last light of day, and the store will soon shut, but the fairylights dangling at the storefront will remain lit long into the night.